Getting useable artwork can be difficult and frustrating. Solve your artwork problems by purchasing our Artwork Wizard service! 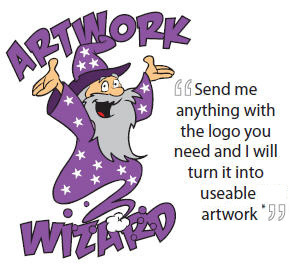 Artwork Wizard will solve your artwork problems for a flat fee. If you don’t have useable artwork available simply send us whatever you can and Artwork Wizard will turn it into useable artwork in an instant! Artwork Wizard can use bitmaps, scanned images or any file type we can open. Photographs, printed material or even objects like shirts and caps are okay. Simply take a photo showing the logo and send it to us. When you need artwork redrawn e-mail it with your product order and Artwork Wizard will work his magic to make the artwork useable for printing. The time spent on typesetting, logo arrangement and minor artwork alterations is free of charge when useable artwork is supplied with the order. When you cannot get useable artwork, send us what you have available. Our Artwork Wizard service will convert or redraw your artwork for a flat fee per logo. We will ask you for your approval before we undertake any work in this regard. Our Artwork Wizard service is intended for converting existing logos into useable artwork and is not intended as a design service. We reserve the right to charge $1.50+GST per minute if we are asked to undertake design work and also for on-going alterations to proofs.